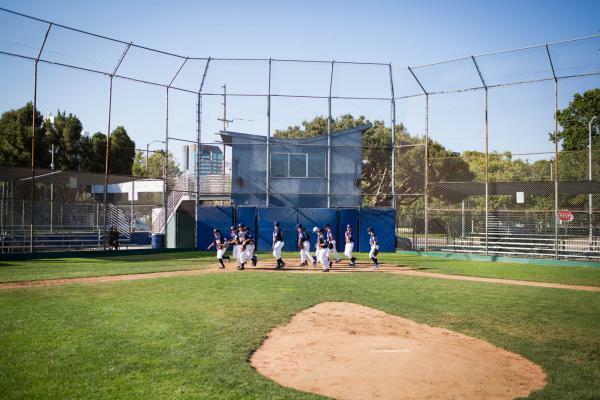 Ten-year-old Jake Herrera and his Los Angeles team run around the diamond as a warmup for baseball practice. Amy Roegler and her husband, Octavio Herrera, live with their young kids, Jake and Alyssa, in Los Angeles. When it comes to pro baseball, they're all Dodgers fans. And Jake loved balls even as a baby, Octavio says. Meanwhile his sister, 8-year-old Alyssa, has a passion for gymnastics. She, too, was a natural, her parents say — swinging on the monkey bars at age 2 and practicing splits on a balance beam today. Jake Herrera says he likes to get to the field early to help with the equipment and get in a little extra batting practice. 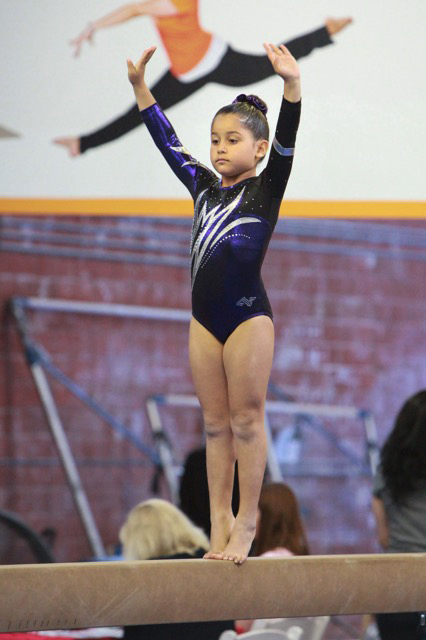 Eight-year-old Alyssa Herrera competes in gymnastics. "Nerves in your stomach, right?" he says. "Butterflies. I remember that as a kid, pitching in a game — 10 years old — so nervous and so scared." "I can't do everything. My partner can't do everything. We hire people who are good at what they do — we put together a team, come up with an idea, execute. It takes teamwork — just as winning a baseball game does." Amy Roegler played soccer in high school and college and says team sports aren't just about winning, but also about developing a solid work ethic, and learning why that's important. Jake's very proud of his All-Star jacket, says his mom, Amy Roegler. She played soccer in high school and college, and says team sports aren't just about winning. Players also develop a strong work ethic, she says, and learn why that's important. 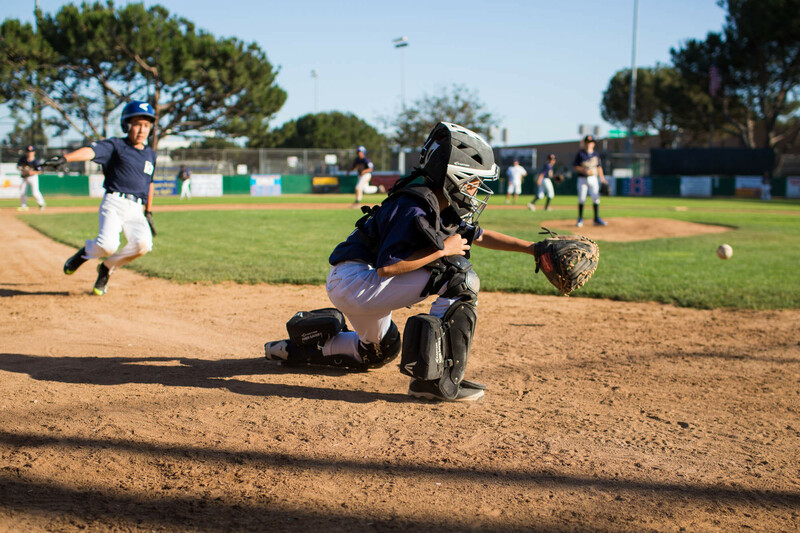 Playing catcher, Jake makes a play at home base during a practice at the Bad News Bears Field in Los Angeles. In just a brief sports experience at camp, that teen and many of the others developed a "can do" life strategy that seemed to translate to other aspects of their lives, Driska says. Our Sports and Health in America series continues over the summer, based on the results of our poll with the Robert Wood Johnson Foundation and the Harvard T.H. Chan School of Public Health. Most parents encourage their kids to play sports. Most also played when they were kids. Those findings were part of a poll NPR conducted with the Robert Wood Johnson Foundation and the Harvard T.H. Chan School of Public Health. Getting kids on the field is not just about physical activity that is good for them. So, though, are the life skills that sports can teach. NPR's Patti Neighmond has more. UNIDENTIFIED MAN #1: Good, OK. That was your best one with your hit. 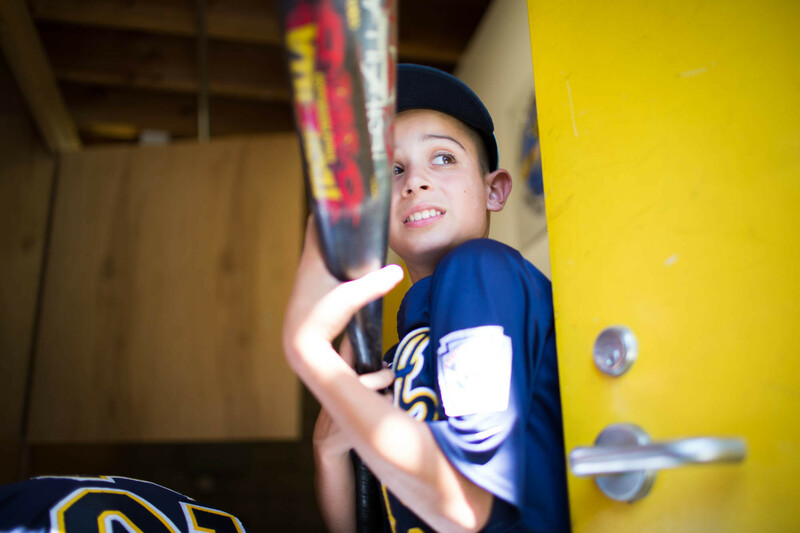 PATTI NEIGHMOND, BYLINE: Batting practice, and 10-year-old Jake Herrera is serious and focused. JAKE HERRERA: My number is eight. I - usually, I prefer seven. That was my mom's number when she used to play soccer. NEIGHMOND: Jake's on the All-Star team. His parents aren't strangers to sports, either. His dad, Octavio Herrera, loved basketball and baseball. OCTAVIO HERRERA: All my fun memories growing up were around sports. And so to me, it's - it was something important to give my kids. NEIGHMOND: Octavio and his wife, Amy, live in Los Angeles. So when it comes to pro ball, they're Dodgers fans. And their kids - well, they say it wasn't whether the kids would play sports, it was which sport they'd play. HERRERA: Jake didn't have a choice about sports, really, being important to him. Since he was a little baby, he had a ball. I think we have a picture of him at 3 months old with a little Dodger jersey and a glove. So he was going to definitely be introduced to sports early, and he took to it right away. NEIGHMOND: And for Jake's sister, 8-year-old Alyssa, her passion is gymnastics. It was obvious, say her parents. She was a natural early on, swinging on monkey bars since she was 2. ALYSSA HERRERA: One, two, three, four, five, six, seven, eight. NEIGHMOND: Alyssa competes. And she's part of an elite team at her gym. Today, she works out with coach T. Rose Anderson. T. ROSE ANDERSON: Ready? Arms - much better. Let's see two more good ones. >>NEIGHMOND; Alyssa's practicing splits on the beam. ANDERSON: Really good. Make sure your feet, honey, land one foot in front of the other. Good, stay on the beam. AMY ROEGLER: When you do sports when you're a kid, you learn how to win and you learn how to lose. You learn what it's like to put in a lot of work and not have things, you know, turn out terrifically. And you learn what it feels like to put in a lot of work and then win. You know, I think you can't teach those lessons. You have to experience them. NEIGHMOND: And that's what the majority of parents in our poll say. Sports isn't just an important physical and social activity, it also builds skills that can make a difference later in life. Harvard professor Robert Blendon co-directed our poll. ROBERT BLENDON: So when they look at their child playing a sport, there is the health benefit right now and in the future. But as importantly, it is that it's getting life skills that they really see will allow their child to achieve things they wouldn't if they hadn't played a sport. NEIGHMOND: Like the Herreras, parents in our poll talked about sports teaching children about discipline, dedication, how to get along with others and building skills to help them in future schooling and even in future careers. Octavio Herrera. HERRERA: Nerves in your stomach, right? You know, butterflies. I remember that as a kid. I remember pitching in a game when I was 10 years old and being so nervous and so scared. And, you know, it's great to have in a situation where the stakes are really low, right? Where, if you fail, you're still going to get pizza and ice cream, and your parents are still going to tell you they love you. NEIGHMOND: And if kids learn to fight through their fear and work through it, he says, it can help them later in life. Today, for Herrera, a software entrepreneur who's created, bought and sold a number of companies, when the stakes are high he doesn't freeze with fear, he moves on. He also talks about the value of being part of a team both in childhood and now. HERRERA: It's just like that baseball team when we were a little kid. Not all the kids were great hitters, right? Not all the kids could pitch. But everybody can contribute. That's, you know, life and business. I can't do everything. My partner can't do everything. We hire people who are good at what they do, and we put together a team and come up with the idea and execute it. And it takes teamwork just as winning a baseball game does. NEIGHMOND: Herrera's wife, Amy, adds that when it comes to team sports, she doesn't really think it's all about winning, it's about developing a sense of work ethic and learning why that's important. ROEGLER: I was the captain in high school, and then my first year of playing college soccer, I was on the bench. And it was - I mean, I was OK with it. I belonged on the bench. You know, I was playing with women that were incredible, and it was - it wasn't hard for me. It wasn't frustrating for me. I was like, all right, you know. And it actually motivated me to work harder and, you know, put in more time. And, like, I wanted to earn it. I didn't want it to be handed to me like, well, we just couldn't get enough girls, so here you go, here's your jersey. NEIGHMOND: Researchers say parents are right when they cite life skills that can develop naturally when kids play sports. Andy Driska is a researcher with the Institute for the Study of Youth Sports at Michigan State University. ANDY DRISKA: Increased confidence in their physical abilities, the ability to be part of a meaningful group, the opportunities to learn about commitment and discipline and dedication. NEIGHMOND: Driska recently studied kids who went through an intense two-week wrestling camp. As expected, confidence increased - it was a tough camp to get through - but what surprised Driska was how much feelings of hopefulness also increased. And the positive attitude, he says, continued into the routines of life afterward. Take this teenage boy, who often argued bitterly with his mother. His attitude did an about-face. DRISKA: And he said that he sat down, he talked it out, they resolved the situation. They came to an understanding about the disagreement. He said that before the camp, he would not have done that. He would not have been proactive in seeking a solution. He simply would've walked away and just been bitter or complained about it. NEIGHMOND: It's a can-do life strategy, says Driska, that should help throughout life. In fact, even nine months after the camp, Driska found the teenagers maintained their bolstered sense of confidence and hope. Patti Neighmond, NPR News. Transcript provided by NPR, Copyright NPR.